Ticks can be found on all four corners of the earth, but they tend to thrive in warm and tropical climates. Ticks require a humid atmosphere to undergo metamorphosis or development in the life cycle. In colder climates, ticks cannot properly develop in the larva and egg stages. Ticks move through many stages in their life cycle to reach full maturity. Some ticks mature in a few months and others can take as long as one year. Ticks are also known to produce large quantities of eggs; in some cases females produce up to 3,000 eggs at a time. Ticks feed exclusively on animal blood as a source of nutrition. Ticks drink blood by puncturing a hole in the hosts skin and then inserting a hypostome, a harpoon like tool located near the mouth and used to draw blood. Ticks will quickly perish if they cannot find a host to feed from. Ticks find their host through detecting carbon dioxide, a gas released when animals exhale. Ticks are also attracted to temperature and vibrations. When ticks feed from their host, they can transmit pathogens, leading to serious infections, illnesses and in some cases death. Ticks can carry many different types of diseases and can transmit multiple diseases to their host at a time. 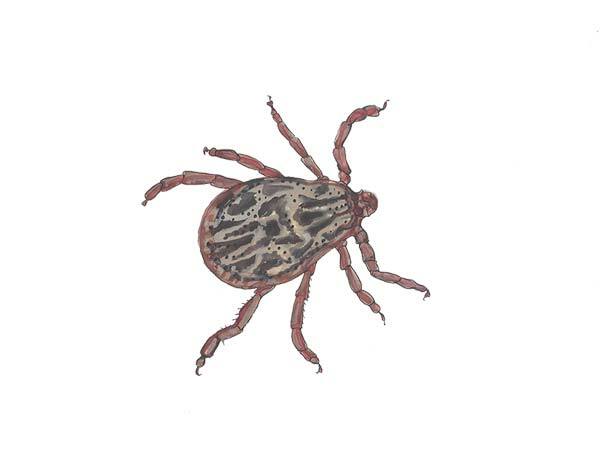 The most common diseases transmitted by ticks are tularemia, lyme disease, Q fever, African tick bite fever, ehrlichiosis, tick-borne meningoenephalitis, heartland virus, Colorado tick fever and rocky mountain spotted fever. Ticks are a serious threat to humans and animals and should not be taken lightly. One of the most common methods for removing ticks is with a pair of fine-tipped tweezers. Be sure to wear sterile gloves and wash the twizzers well when finished. Use the tweezers to grab the tick as close to the mouth as possible, avoiding the swollen body of the tick. Pull the tick straight and do not twist. Twisting or yanking may break off the ticks head in your skin and cause an infection. After removal, wash the bite area, your hands and tweezers well with warm water and soap. Apply antibiotic ointment to the bite area and cover with a bandage. If the area becomes infected, seek medical attention. Getting rid of ticks can be a difficult and daunting task. Homeowners must take several steps before beginning initial pest control treatments. Seek medical help from a local veterinary clinic and they will prescribe the correct tick medication for house pets. Tick prevention starts with the right medication. Once the animal is on tick medication, the house can be prepared for tick pest control. De-clutter the inside of the home, eliminating all possible harboring areas. Thoroughly vacuum the inside of the home and empty the bag outside and into a trashcan. Take the trashcan to the end of the road keeping the lid sealed. Clean the floors using a mop with hot water and soap. Clean animal resting areas. Wash blankets and toys in high heat and vacuum bedding materials. De-clutter the outside of the home. Discard any lawn clippings, waste, and log piles. Insecticide should be applied to the entire front and back yards using a high power spray truck. Special attention should be paid to areas where animals rest and play the most. Inside the home, insecticide should be applied around the perimeter and in areas where animals frequent the most. In order to eradicate the juvenile ticks when they hatch, a minimum of two treatments are required, 7 to 10 days apart. Tick pest control requires both aptitude and skill; therefore it is recommended that you seek a licensed pest control technician for assistance. We have been getting rid of ticks in home since 1934. We serve Bradenton tick control, Lakewood Ranch tick control, Ellenton tick control, Bradenton Beach tick control, Parrish tick control and surrounding areas. Call us today to solve your tick problem. Cloud Termite and Pest Control services Anna Maria tick control, Palmetto tick control, Holmes Beach tick control and surrounding areas.